SEOUL—North Korean leader Kim Jong Un has placed his military on high alert and declared a “quasi-state of war” in frontline areas Friday after North and South Korea exchanged artillery fire near the border. Seoul also has raised its military readiness to its highest level, suggesting imminent threat. Following an emergency meeting of the North’s central military commission, Kim said frontline units would “enter a wartime state” starting at 5 p.m. local time Friday, according to the Korean Central News Agency. In Beijing Friday, North Korea’s ambassador to China called a late-afternoon news conference at which he repeated the warning about Saturday’s deadline. He said North Korea is a country of action, not words. When asked about Beijing’s opinion of the escalated tensions, Ambassador Ji Jae Ryong said that was irrelevant. Thursday’s violence began when North Korea fired shells at South Korean military positions along the western border. The South responded by launching dozens of 155-millimeter artillery rounds at the North. South Korea’s aim is “to seize our government and our lifestyle,” Ji said. The exchange of fire was the first between the two Koreas since last October, when North Korean soldiers approached the military border and did not retreat after the South fired warning shots, the South Korean Defense Ministry said at the time. The North’s soldiers fired back in an exchange of gunfire that lasted about 10 minutes, with no casualties. The nuclear-armed North has condemned South Korean propaganda being blasted from the speakers as equivalent to a declaration of war. It was this that triggered Thursday’s exchange of fire across the demilitarized zone, or DMZ, and Kim’s latest ultimatum — stop the broadcasts by 5 p.m. Saturday (4:30 a.m. ET) or face military action. What makes this incident more worrying is that this time the North followed through with a threat, which usually doesn’t happen. And the South hit back robustly, something that is also rare. What will happen with North and South Korea? Because of biblical prophecies involving “the kings from the east” cooperating at the end (cf. 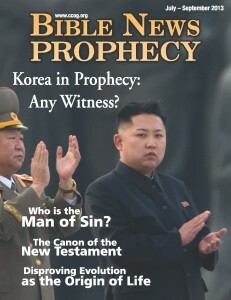 Revelation 16:12; Daniel 11:44), we in the Continuing Church of God have taught for years that somehow North and South Korea would likely be unified (or at least work more closely together) prior to the return of Jesus Christ (see also the July-September 2013 edition of Bible News Prophecy magazine). The literal translation of Revelation 16:12 is “the kings of the sunrise” and thus this would seem to have to include Korea–which among the most eastern of the nations. But it could take a battle or more for that to happen. One that may not turn out well for the North Korean leadership. It should be noted that the USA has a treaty arrangement with South Korea, and in the event of a real war, the USA has obligations to assist and defend South Korea, and North Korea realizes this–that might be why its Kim Jong Un decided to call this a ‘quasi state of war,’ as opposed to an actual one. Caution is advised for any who think that since the USA can defeat North Korea militarily that North Korea would not try to set off a nuclear device (either through a launch or throw some other means) or be involved in terrorism that could hurt South Korea or or Japan or even the USA. Jesus spoke of a time of troubles prior to the Great Tribulation (Matthew 13:7-8) and North Korea may well fit in with those. Since the Koreans are Asians and occupy the “land of the sunrise” (Revelation 16:2), for years I have written that I expect that they will reunify. The reunification of North and South Korea is consistent with biblical prophecy. But North Korea may take unusual actions before then, and it may regret doing so. Whether this reunification will be because of a war involving the USA, South Korea, or something else (such as waiting until Revelation 9:16; & 16:2), is not clear. But the situation in Korea will change. As Jesus said, “And what I say to you, I say to all: Watch!” (Mark 13:37). This entry was posted on Friday, August 21st, 2015 at 6:30 am	and is filed under Prophecy.